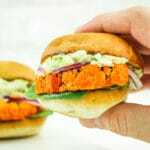 This Buffalo Cauliflower Sliders recipe is mind-glowingly delicious! Mini cauliflower steaks are roasted in buffalo sauce and topped with an irresistible blue cheese slaw. These are the perfect vegetarian game day recipe or cookout option! Preheat oven to 400º and line a large baking sheet with parchment paper. Starting with a whole head of cauliflower, chop off the bottom stalk. Then, remove sections of florets, keeping them as large as possible. Select the largest florets and cut a cross-section horizontally down the center. Chop again to create a “slab” – these should be about ½”-¾” thick. Repeat the process until you run out of florets. If your “slabs” are on the small side, I recommend cutting more than you think you’ll need so you can stack them on the buns. Place the cauliflower “slabs” on the baking sheet and coat both sides with buffalo sauce. Roast for 30 minutes, flipping halfway. While the cauliflower is cooking, make your blue cheese slaw! In a large bowl, combine slaw mix, blue cheese dressing, salt and pepper, and mix until combined. If desired, you can also toast your slider buns while the cauliflower is cooking. To do this, I lightly spray a skillet, bring it to medium-high heat and place the buns onto it, cut side down. Heat until golden brown. After the cauliflower is done, place 2-3 “slabs” on each bun, top with the blue cheese slaw and whatever else you like, then enjoy!